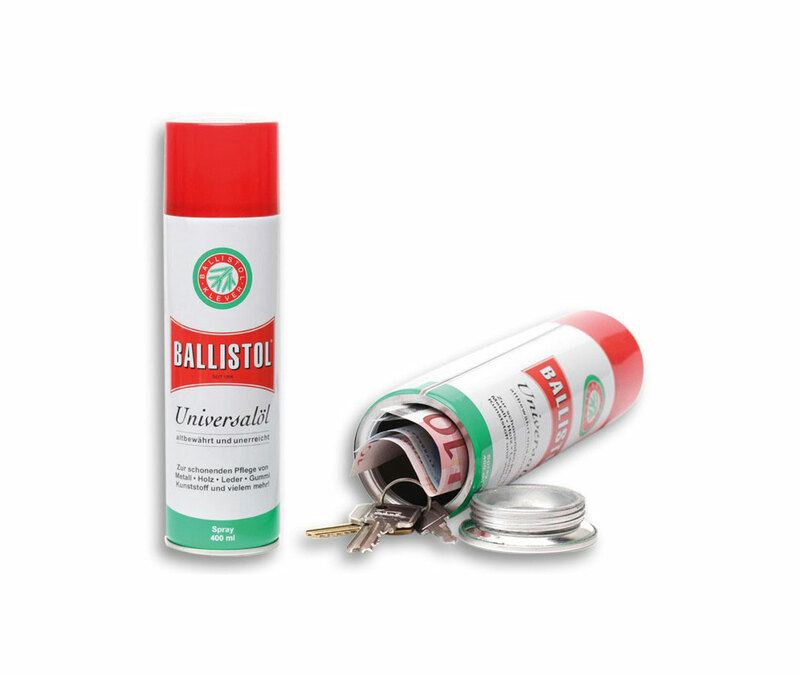 The Ballistol-Universal-Oil aerosol-spray cansafe fits in a shelf with cans such as those in the garage, in the cellar, in the storage closet safe and is not perceived as a safe for valuables. You would like to protect your valuables? You are worried about your cash money? Your secrets should remain secret? The solution is the can-safe – a modern secret hideaway, also perfect as a present. Conceal your treasures in obviously worthless everyday objects.Thieves search for jewels under your mattress in your wardrobe and of course in your safe. Mobile hidden stash safes for valuables take up a proven principle of camouflage and conceal the actual character of the safe by the appearance of a traditional product. The aerosol-spray Cansafe Ballistol Universal Oil fits in a shelf with cans such as those in the garage, in the cellar, in the storage closet safe and is not perceived as a safe for valuables. Hidden safes are unique security products not only for at home. In contrast to conventional safes and containers, they have the advantage of being also used on the road . Money, credit cards, jewelry, keys, confidential documents, drugs and other valuables or secrets: everything can be discreetly hidden. The cansafe can be opened via a cleverly attached screw cap. Nowadays no safe seems to be safe from unscrupulous burglars.But no one would search for something in a common aerosol-spray. Even the most modern safety technology does not protect from thieves and burglars. Be smarter than criminals are! To hide your properties use our unconventional hideaways. An average can in your refrigerator being a can-safe or a screw in your tool box protect your treasures in a better way than any cash box can. All our secret hideaways are professionally manufactured and not recognizable, even by second sight, among original products.Thus there is enough space in these refined hideaways for money, jewels and medicine.